Posted by Erin Ptah in And Shine Heaven Now. …and to be fair, it worked. 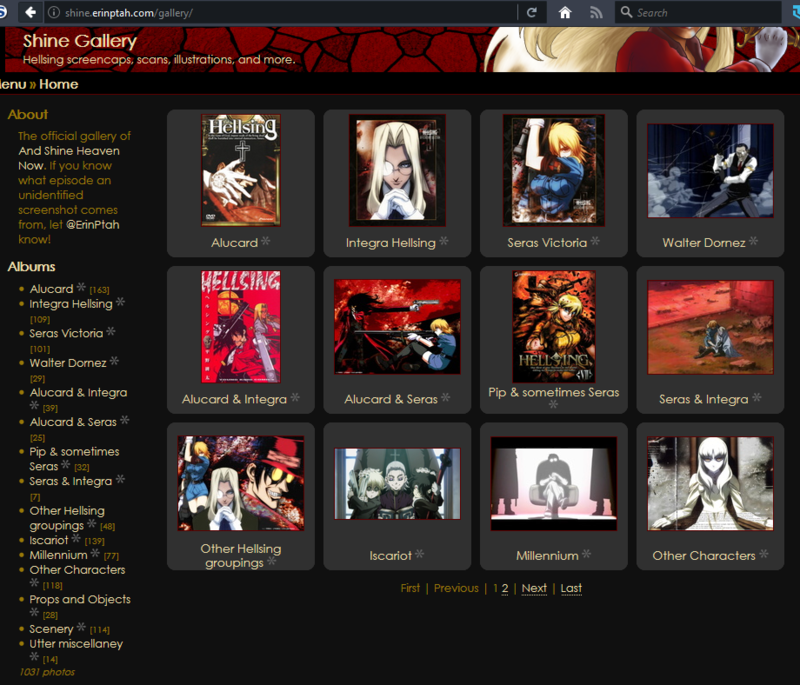 I’d sort of resigned myself to never making a fully posted-and-sorted gallery of my Hellsing image folders. Tried a couple of different hosts over the years and none of them suited. Then, after figuring out how to start a Leif & Thorn wiki, I realized my host also has one-click installations for gallery software. A bit of research on comparative features and we were in business. Check out this lovely tag page. Mmmmm. There were a bunch of anime and OVA screencaps where I didn’t know offhand what episode they were from — if you can pinpoint any of them, drop a line and let me know. Not yet posted: a buttload of OVA screencaps that are so unsorted, they still have their auto-added VLC filenames. But now I finally have a place to put ’em when they’re ready. Posted by Erin Ptah in And Shine Heaven Now, But I'm A Cat Person, Leif & Thorn. Jany tries her hand at hacking! Not on her own, thankfully. Leif gets an update from Katya, and wants to go visit Thorn…if he can finish his work first. Sparrow drops a bombshell, just in time for the rest of us to go on holiday break. Leif is no match for two ten-year-old girls who want to swim. A younger Ann Walker fires some people, visits Japan, and stops by a certain somebody’s college campus. Today (or yesterday, depending on how you count it) marks the end of And Shine Heaven Now. Although the strips started going up in June 2003, there was a substantial buffer that took a while to build up, and of course the whole idea must be traced back to the first time I saw Hellsing, sparked when my Integra-fangirling began in earnest around episode 3. It was the first thing we watched in anime club my freshman year of high school, fall of 2002. Nine years ago. Shine has been with me almost half my life, comprising my entire teenage years and adulthood (or “adult”-hood, to go with how it feels so far). It’s the longest single thing I’ve ever worked on. From high school to college to moving into my own apartment, interspersed with visits to seven other countries and who knows how many U.S. states, it was always present: a constant obligation, a constant work in progress. During its last few years, the emphasis on the “obligation” aspect grew. Especially with the final showdown, all the different facets and plot threads and sub-battles that got addressed, when the storylines traded “what wacky adventure are our heroes getting up to now?” for “how can I work through this next showdown and plot advancement in a way that feels new and fresh and funny?” There was a lot that was cool, if I do say so myself, and a lot of scenes that I had literally been looking forward to drawing for years beforehand. It just took a while to get there, is all. The final, post-war storyline was a final chance to really cut loose, with fifteen intervening years of wacky adventures making a handy excuse to change any continuity that felt too constraining. I threw in everything: alternate-universe Nazis, steampunk zeppelins, magical fempreg, My Little Ponies, the future city of Crystal London, the works. And when I started drawing it, I felt a bit of the old spark: the one that had me overflowing with storyline ideas, and carried me through completing ten or twenty strips at a time. And then maybe I’ll go back to sleep. Or maybe I’ll suddenly remember some last-minute art I meant to do for But I’m A Cat Person, or some project for grad school (which I’m starting in spring of 2012) that’s in need of urgent attention. Because that’s life. And life, as it tends to do, goes on. Rip’s imminent defeat at the hands of Lupin &co., and the answers to more of your burning questions. Patrick and Reseda, facing off? Bianca isn’t going to take this well. Posted by Erin Ptah in And Shine Heaven Now, Recommendations. Sometimes it seems like the only way I ever get anything done is when it’s in order to procrastinate on something else. I then sat down and churned out two weeks’ worth of Shine strips in two days. Another worthwhile thing I’m dragging my heels on: reviewing And Shine Simple Heroes, which, seriously, if you are a Shine fan at all, you need to read. Even if there are sections where you start to glaze over for not recognizing the crossover characters, hang in there — the ending is absolutely golden.